get a free book besides! (for yourself or a loved one)! 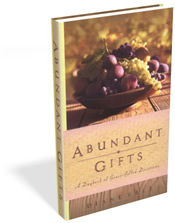 When you buy one or more copies of Abundant Gifts, you will get a free book. 2. Once you click the green Checkout button, you will get to the order form. On that order form, there's a place to specify "Comments/Special Delivery Instructions." That's where you can tell me what kind of book you prefer--fiction or nonfiction. (It will be a Christian book, unless you tell me you don't want that.) You can also tell me which edition of the book you prefer. 3. The order form won't say anything about a free book (if I listed it, I'd have to charge you extra postage), but you will get your book. It will be a surprise ... like so many of the gifts God himself gives us. Yes, Diane, I want to get the book now. If you prefer to send a check, that's okay too. Send a check for $17.59 (to cover postage and handling) to: Diane Eble, 0S430 Jefferson, Winfield, IL 60190. Include a note with your name, shipping address, phone number (in case I have a question), and what kind of free book you prefer (fiction or nonfiction). I’ll prepare your order when I get your check and send it out as soon as your check clears. I hope you enjoy this fun little extra! Note: If you want to give the book as a gift, click here for extra instructions .